Everybody else had gone to town, but she was happy she had stayed home. She glanced around the farmhouse. The floor was swept, the breakfast dishes done, the house tidied. Now her own fun could begin! She went to the one bookshelf in the house. Built into the writing desk, this shelf held all the books her family owned. Of course, it wasn’t hard to find the one book she wanted – the one with the light grey cover. After wiping her hands on her skirt to make sure they were clean, she slid the book from the shelf, and, carrying it in two hands, went outside. A smokey-grey farm cat scuttled in front of her as she stepped out the door. Many days she would have followed the cat, but not this time. She settled in the sun-warmed grass near a scraggly tree. Here enough of a breeze blew to keep her comfortable even in the summer weather. This is how I imagine my grandmother as a girl, enjoying the book she passed down to me. What book was that? The Best Loved Poems of the American People. Some of the best loved poems of not only the American people but of people the world over are poems that tell a story. Here are a few that you might enjoy whether you are 9 years old or 99. Yes, I do love “Words that paint a master-piece/Words that beat a rhyme”. and, Grandma, I’m glad you do, too. Thank you for sharing not only your book of poems with me but also the book-worth of stories from your life. Happy Birthday with love! Ever wonder where your favorite story was written? Tolkien used his stately desk, Laura Ingalls Wilder enjoyed her farmhouse nook and Robin Jones Gunn loves her Hawaiian nest. And me? Well, I wouldn’t claim to stand amongst writers like them, but I can still show you the corner of the world where I often pen letters, jot journal entries or scribble story plots. First I have to share its story. 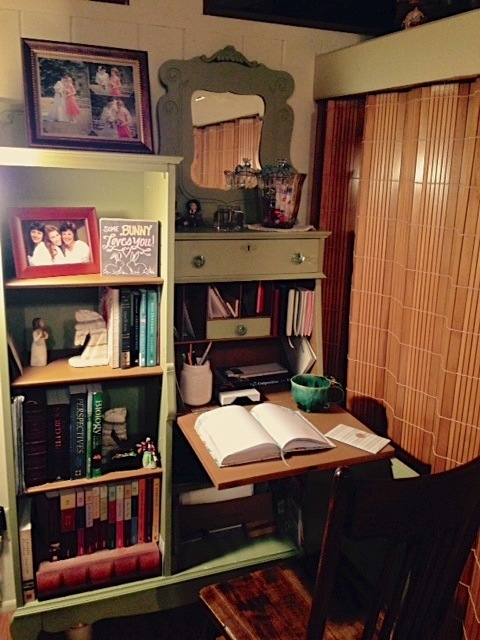 A writing cabinet with three shelves, a cupboard, a mirror and a fold-down desk stood in my (living) Grandma’s childhood home and later served one of her sisters. It was well used and loved like many pieces that saw the Great Depression. This past fall, it was given to me. The glass door was long gone, but the mirror was still there. I especially loved the cubbies above the desk! After spending a few days hearing tales about the world this cabinet watched, I knew I wanted to do something special with it. However, before anything else, it needed some work. My family pitched in to refresh this heirloom piece. 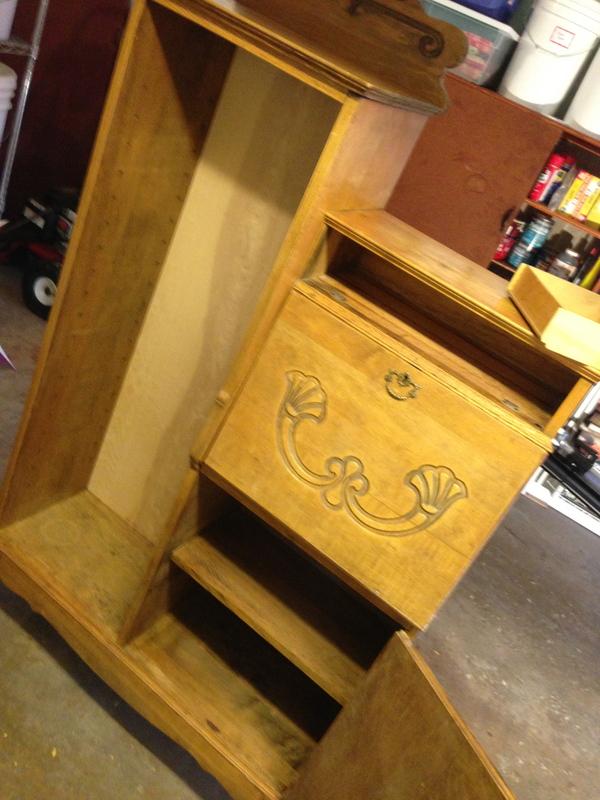 Cleaning, shellacking, sanding, painting, repairing…It took a fair amount of TLC. Was all the work worth it? See for yourself! Pretty darling, isn’t it? The brown paint represents the hard work of past generations who put down roots. The green represents growth and new life. I like to think this cabinet got a fresh start. In some ways, it’s like it’s a whole new creation. It makes me think of what God does for His children. He makes us new. “Therefore, if anyone is in Christ, he is a new creation. The old has passed away; behold, the new has come.” (2 Corinthians 5:17, ESV). It’s like He gets out His brushes, paints, sandpaper and cleaning cloths and gives a cobwebby, musty, chipped, scratched heart a makeover. Sure, there will still be some rough edges or the paint will need a touch up, but where it counts the Master Carpenter gives His workmanship a fresh start. 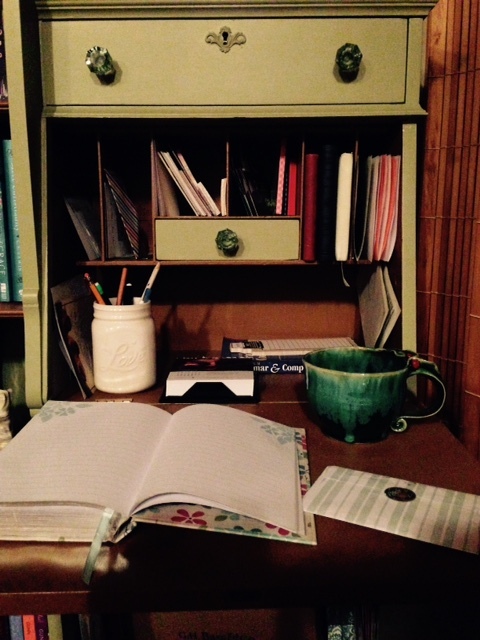 That’s a theme that rambles through my head when I come to my little writing desk. My Grandma who went to heaven earlier this year told me that there was a cabinet nearly identical to this one in her childhood home as well. Her minister father kept his sermons organized on the shelves. You can imagine the “made new” cabinet is even dearer to me now. For a couple of seasons, I had the pleasure of working at a living history museum. Most of the time, I could be found in the one-room schoolhouse, looking like I had sprung off the pages of Anne of Green Gables. Along with the joy of meeting new little ones each day, my favorite part was listening when the “old folks” started talking. A particular visitor even testified that the tricks of schoolhouse lore, like dipping a girl’s braid in an inkwell or tying her apron strings to her seat, really did take place. As much as I tried to convey my delight, I’m not sure these dear story-givers ever truly grasped how much I relished the glimpses they gave me into these bygone days. They were like pots of gold on my treasure hunt to uncover true stories to share with the 21st-century schoolchildren who visited my school. To the history-bearers, their schoolhouse days may have seemed just ordinary life, but to me and the boys and girls who came running as my bell rang, they were as beyond ordinary as fairy tales! You see, most of today’s children will never do farm chores before they head to school, much less ski to school – Little boys often burst out in exclamations of envy at that point! – or listen in on the lessons of their brothers and sisters or go ice skating with them at recess. And today’s generation of seniors are pretty much the last ones who can share these stories firsthand. With that in mind, as often as I could (and when I remembered), I would encourage my students that their grandparents or another older person in their lives may, in fact, have attended a one-room school not so different from the one in which they were sitting. My hope was for the children to go on their own treasure hunts. This is one of the beauties of living history museums: they make history tangible. Just like it’s one thing to read about Anne Shirley and quite another to wear ridiculously puffed sleeves yourself, so it’s one thing to read about a one-room school and quite another to sit at a desk where someone sat a hundred years ago and take a slate pencil in your hand to work arithmetic problems given by a teacher. And if you have someone with you who can tell you firsthand how it really was, that’s even better! That’s why this spring, as you plan your outings or field trips, I encourage you to visit your local (or distant) living history museums and to take someone who is just a little bit older with you. Besides enjoying fresh air and learning history facts, you’ll have the opportunity to ask questions – Was your school anything like this? What was different about your farm? Did your mom bake bread like that? Did you really butcher the pigs? – and be a part of bringing history to life. Make it your own treasure hunt. Who knows what riches you’ll uncover along the way!